This dessert tastes like summer vacation to me. Ice cream is the quintessential warm-weather indulgence, and the tart strawberry ripple undulating through this recipe’s sweet basil cream makes it the perfect poolside snack. The inspiration for this sweet treat came from my sister in-law, Fatima. When I was visiting her last Christmas, she taught me to make mint chocolate chip ice cream from scratch using bunches of fresh spearmint to flavor the ice cream custard. I used Fatima’s technique along with fresh basil from Pure Luck in Dripping Springs, Texas, to create this not-too-sweet basil ice cream. When I was testing this recipe, I discovered that the earthy flavor of basil creates a very full-bodied ice cream. To punctuate and balance that richness I used some homemade strawberry jam to create a ripple: a thin layer of sauce that’s distributed throughout the ice cream. Creating a fruit ripple in home-churned ice cream is easy, and all you need is some jam, pie filling or sweetened fruit purée. As soon as the churned ice cream has been poured into a storage container, gently spread an even layer of jam or fruit purée across the top of the ice cream. Cover and freeze as usual, and when you serve the ice cream later a perfect ripple will appear automatically in each scoop. If you’re out of fresh strawberry jam, peaches from Caskey Orchards in San Marcos or blackberries would pair just as well with basil, and they’re in season now. To create a blackberry or peach ripple, you can macerate chopped fruit or whole berries in sugar and purée them, or you can use your favorite recipe for pie filling or freezer jam and purée the finished product. Whatever fruit, jam or pie filling you use, it’s important that the ripple be completely smooth since the high water content of whole berries or peach chunks turn them into ice cubes when they freeze, ruining the creamy texture of the ice cream. Before you begin, you’ll need some specific equipment for this recipe: a mesh strainer, a saucepan, a whisk, a few spoons, a 1.5 quart ice cream maker, and a few bowls: one large metal mixing bowl which will sit in an ice bath (use a bigger bowl or the sink for this) and a small mixing bowl. A kitchen thermometer isn’t absolutely necessary, but it is useful. 1. Wash and dry basil and tear it into several handfuls of loose leaves and stems. In a medium pan, warm milk, sugar, one cup heavy cream, salt, and basil. Stir occasionally. Once mixture is hot, about 150 degrees, remove from heat, cover, and let sit for 30 minutes to infuse basil flavor. 2. Set a large metal bowl over an ice bath (a bunch of ice in your sink or in a larger bowl.) Pour the reserved cup of heavy cream into the bowl and set the mesh strainer on top. If you haven’t already separated your egg yolks, do that now, and set them aside until step 4. 3. Once 30 minutes has passed, remove the basil leaves and stems from the infused cream by pouring the mixture through a mesh strainer into a small bowl. Use the back of a spoon to press down on the basil leaves, squeezing out any remaining liquid, then discard the basil. * Return the infused cream mixture to the pan. 4. Rewarm the infused cream mixture over medium low heat. In a separate bowl (the one you strained the cream into before is fine) whisk together the egg yolks. Temper the egg yolks by ladling the warm, infused cream into the egg yolks a little bit at a time, whisking constantly, until the egg yolks are warm. Pour the warmed egg yolks into the pan with the rest of the infused cream. 5. Cook the custard, stirring constantly until the mixture thickens and coats the back of your spoon, or at about 170 degrees. 6. Immediately strain the custard into the big mixing bowl with the reserved cream. Stir together over the ice bath until cool. Transfer cooled custard to an airtight container and refrigerate for at least 4 hours. Overnight is better. 7. Freeze the ice cream according to the directions that came with your ice cream maker. When ice cream has reached soft serve consistency, transfer it to an airtight container and gently spread strawberry jam in an even layer over the top of the ice cream. Freeze for at least three hours before serving. *I saved the basil leaves in a Tupperware in the fridge and used them to sweeten tea throughout the week. This was a real treat and much less indulgent than the ice cream! This was Rami’s and my first married New Year’s Eve, and we spent most of it apart. He had a gig playing Beatles tunes with the Austin Symphony. I stayed home in my PJs and rediscovered PhotoShop. (We just got the newest version. It rocks.) By the time he got home around 11:00 we both kinda wanted to go to sleep. But that didn’t feel quite right, with it being our first married New Year’s Eve and all, so we made some small talk about resolutions. As midnight approached, we decided to make a toast. 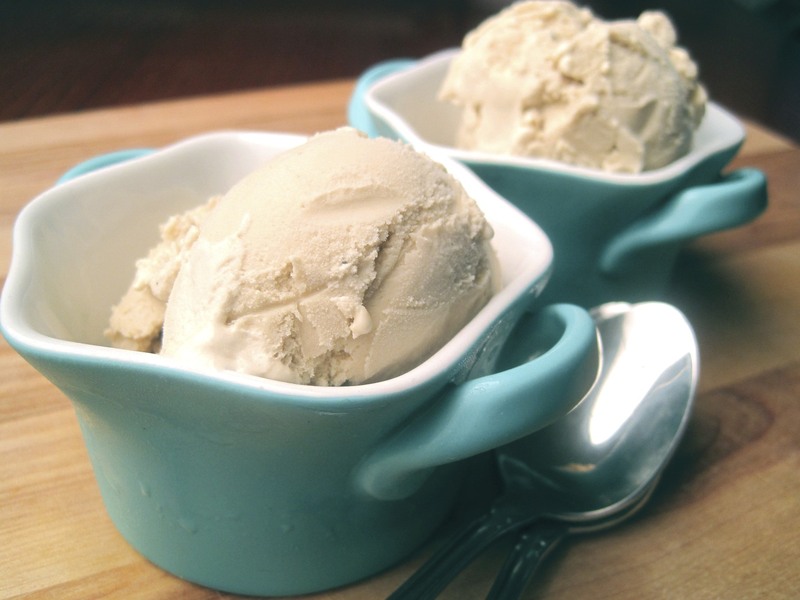 We don’t keep champagne on hand, so I pulled out the fanciest thing we had in our kitchen: this Masala Chai ice cream. We dished it up clinked our spoons together as the ball dropped. The first bite of ice cream was like hot snow, and we both moaned when we tasted it. Sweet cream brushed up against spicy chai as the ice cream swept our tongues. 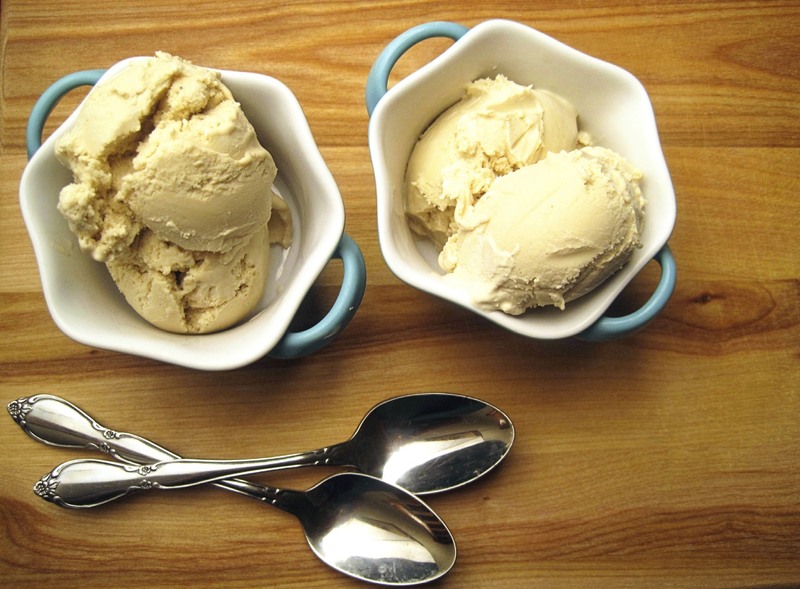 Each spoonful had a velvet finish, with hints of cinnamon, ginger, cardamom and black pepper. By the time we lapped up the last bit, New Year’s Eve finally felt like something special. I can’t take credit for the magnetism of this dish. The chai is from Austin’ own Zhi Tea Gallery, and the recipe belongs to my sister-in-law, Fatima. Her cream steeping technique imbues the ice cream with deep flavor using fresh or dried herbs, and the final product is infinitely better tasting than an ice cream flavored artificially. The best part is, you can adapt this recipe for any kind of tea or fresh herb by adjusting the amount of herb and steeping time according to taste. Finally, a happy coincidence: I just saw that today’s Austin Groupon is $20 for $40 worth of merchandise at Zhi Tea! Since Masala Chai from Zhi Tea is the standout ingredient here, I couldn’t resist. And with almost 100 different flavors available from Zhi, just imagine the crazy ice creams you could make!! 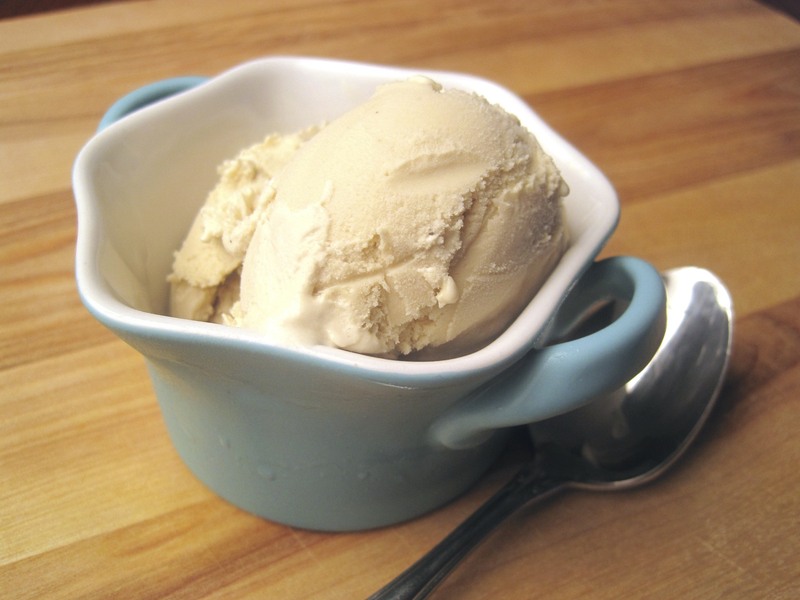 Just the idea of Honeybush Rooibos and Vanilla Rose ice creams has my mouth watering. 1. In a medium pan, warm milk, sugar, one cup heavy cream, salt, and tea leaves. Stir occasionally. Once mixture is hot, about 150 degrees, remove from heat, cover, and let sit for 30 minutes to infuse chai flavor. 3. Once 30 minutes has passed, remove the tea leaves from the infused cream by pouring the mixture through a mesh strainer into a small bowl. Use the back of a spoon to press down on the tea leaves, squeezing out any remaining liquid, then discard the tea leaves. Return the infused cream mixture to the pan. 7. Freeze the ice cream according to the directions that came with your ice cream maker. When ice cream has reached soft serve consistency, transfer it to an airtight container and freeze for a few hours before serving. I sampled this recipe at both the soft serve and completely frozen stage (just doing my duty here!) and the flavor is better developed after a few hours in the freezer. Last week we got a Canary Melon in our local box. Honestly I had never heard of Canary Melon before, and I was sort of hoping we’d get arugula instead so I could just avoid it altogether. Canary Melon sounds terrible, like a fruit made out of birds or a big sweet egg. Luckily my first instincts about the Canary Melon were way off base. In actuality this little, slightly lumpy melon is like a cross between a canteloupe and a honeydew melon. It has canary yellow skin and bright white, firm flesh. As soon as I tasted the canary melon I knew I wanted to make something cold with it in celebration of the end of summer here in Austin. 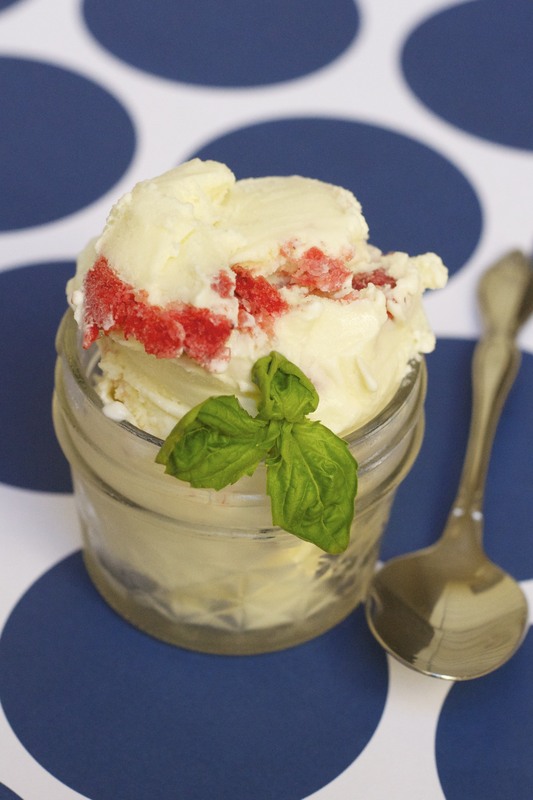 The musky sweet flavor of the melon lends itself beautifully to this simple ice cream. I adapted a strawberry ice cream recipe from the instruction manual that came with my Cuisinart ice cream machine, but you could really use any vanilla ice cream base and get a good result. This recipe turned out terrific, but it is very rich. Next time I think I’ll try making tart Canary Melon frozen yogurt, so I can indulge with a little less guilt. Seed and chop the canary melon. Remove skin. Puree melon chunks in a food processor; add 1/4 cup sugar and lemon juice to food processor and pulse until sugar is dissolved. Strain melon puree through a mesh sieve, reserving one cup of liquid & melon pulp. In the same food processor (no need to rinse the bowl), combine milk and granulated sugar. Process for about 2 minutes until sugar is dissolved. Turn ice cream machine on, pour milk mixture, cream, and one cup of melon juice through ingredient spout. Let mix until thickened, about 30 minutes. Add the melon pulp to the ice cream in the last five minutes of mixing. 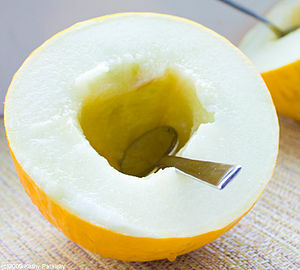 *I saved time by cutting the canary melon as soon as it ripened and storing the prepared melon in an airtight container in the freezer for about a week. I pureed it straight out of the freezer and everything tasted terrific.